LangMan Professional is an economical component set for developing efficient commercial VCL applications for 32-bit and 64-bit Windows. It will not take you long to get used to working with the LangMan components, and you will not have to learn anything complex. LangMan have been developed in order to save the maximum time. 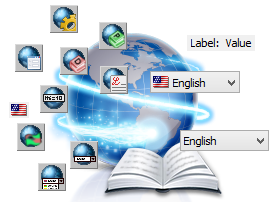 In contrast to other localization tools, the LangMan components have the great advantage of making the language editor easily accessible also to the users of your application. Thanks to that even they will be able to participate in the development of new localizations in other world languages which will more easily and quickly open a way for your application to users all over the world. 9 LangMan components, including source codes for unlimited use. Basic technical support for troubleshooting. Access to all newly issued versions of the LangMan Professional for the minimum period of three years. Per-developer - The number of installations is not limited, but need to purchase as many licenses as developers within one business entity will be work with LangMan components. Corporate - The unlimited license for the whole company. Across the company may work with LangMan components unlimited number of developers on any number of installations. Manual for LangMan components package for Delphi in Czech. Manual for LangMan components package for Delphi in English. Quick look at LangMan DEMO. To compile you need LangMan Premium or LangMan Ultimate. Executable uniGUI server of DEMO application.